In this easy magic trick, you insert a coin into a handkerchief that you're holding in your other hand and the coin mysteriously disappears. It's a baffling vanish effect and it's simple to learn and perform. A plus, you can perform this one just about anytime, anywhere. All you need is a quarter and a handkerchief, and that special secret. For the secret, turn to the next pages. You'll need a coin ( a quarter will work just fine and this may be borrowed), a handkerchief and a rubber band (the smaller the better). The secret lies in the rubber band. Before you perform the trick, wrap the rubber band around the fingers of one hand. You may have to double or triple-loop the band so it forms a tight "ring." With the rubber band in place, you’re ready to perform the trick. Walk out with the rubber band around your fingers. Don’t draw any attention to this hand. Just keep it hanging at your side or in your pocket. Ask a spectator for a quarter and show the handkerchief with your other hand. Drape the handkerchief over the hand with the rubber band. Place the quarter into the handkerchief. What you’re doing here is spreading the rubber band and inserting the coin and a piece of fabric from the handkerchief into the stretched rubber band to form a little pocket. (Click hereto see the pocket from the back). Let the rubber band slip off of your fingers. The band should tightly close-up, trapping the coin in a bit of fabric in a secret pocket. Bring out the hand that formerly held the rubberband and let the handkerchief fall. If you like, you can utter some magical-sounding incantation. The coin will look as if it disappeared. If you like, you can even shake the handkerchief a bit and the coin won't fall out and this will help convince your spectators that the coin has vanished. Obviously, you can't allow spectators to examine the handkerchief as they will discover the secret. Simply bunch up the handkerchief in your hands and put it away in your pocket or aside in a case. The coin will be held in a little pocket formed by part of the handkerchief and the rubber band. 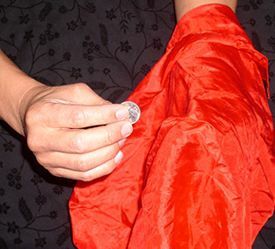 For another method of vanishing a coin within a handkerchief, click here. This easy magic trick offers a nice companion magic trick that relies on an entirely different secret. In this easy magic trick, you are performing for a group of people and you cause the coin to vanish again, and this time, your spectators can closely examine the handkerchief. If you're interested in exploring yet another way to vanish a coin, check out this easy magic trick with a distinctly different approach. This trick doesn't require any cover (handkerchief) and is particularly out in the open. In this trick, you'll learn how to make an intriguing gimmick that's easy to construct and only takes materials and tools that you have around the house. When you're ready to perform the trick, the gimmick does most of the work of making a coin vanish. And if you're interested in learning how to perform more magic with coins and money, you'll find some great easy magic tricks in our collection along with clear, step-by-step instructions.